This is a very well made 16 gauge mild steel "Great" helm style helmet. It is a hand hammered helm, not just rolled steel, note the rolled lower edge finish. It is welded on the inside as well as riveted together. The helmet itself features narrow eye slits to help reduce glare, and additional breathing holes for the mouth and nose. The heavy brass over steel gives it a nice, decorated look. The helm is 9 inches side to side at the ears, 10 inches back to nose. This helmet is based on many examples in art and literature as well as in museums. 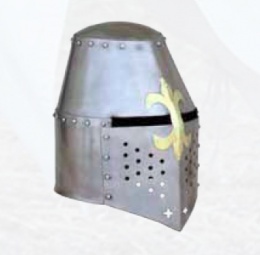 While many people associate this style of helmet specifically with Crusaders, it was actually in use in most of Northern Europe during the eleventh and twelfth centuries. This page was last modified on 29 May 2014, at 18:41.